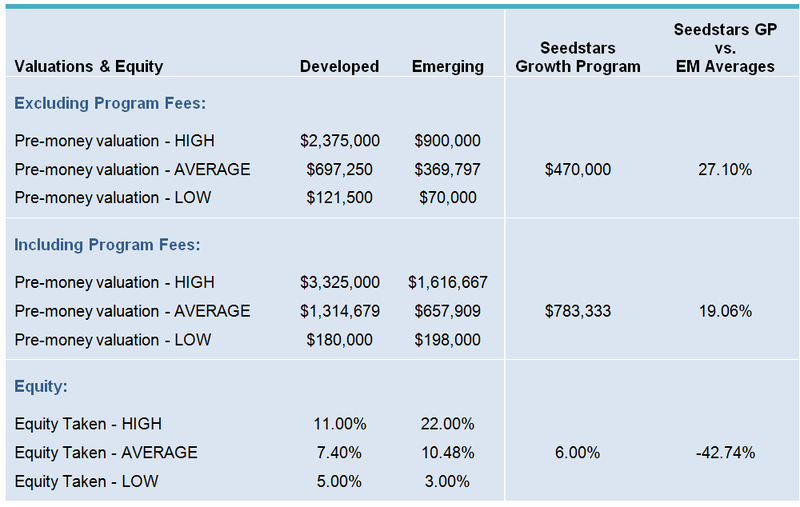 While contemplating the package for the next batch of ventures in the Seedstars Growth Program, we wanted to understand exactly how our offer compared to all the other acceleration, growth and incubation programs out there. There is a lot of analysis on the results of the different accelerators in terms of funding raised for batches and successes/failures but nothing regarding the actual package founders get in terms of the implied valuation going into a program. Accelerator packages aren’t easy to compare as they offer different structures (equity vs convertible), sometimes contain program fees, run for different lengths and of course be of different quality. To run an analysis, we pulled together data from 44 startup programs (fully available here), made some assumptions, analysed the findings and are open to sharing the findings. The cash made available to startups is a key consideration for founders and will often be the only lifeline during a program as the focus is on execution rather than fundraising (at least until demo day). 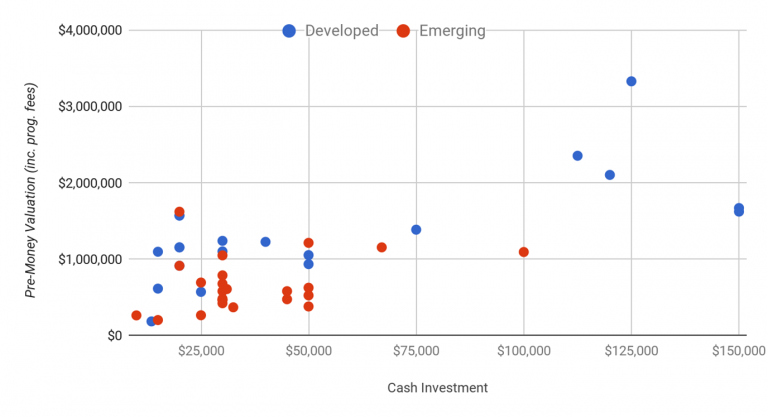 Valuation aside, the average cash investment made in developed markets is $53,857 versus almost half the amount of $36,761 in emerging markets. This difference is understandable given different costs of living between developed and emerging markets (eg. London is 57% more expensive than Bangkok, 57% more then Cape Town, 55% more than Buenos Aires – source Numbeo). Some programs make it clear how much you are paying for the services, others just lower the valuation they offer startups and therefore bundle it in as a hidden cost. We prefer to give founders the value to align expectations. Of the 44 programs in our analysis, only 13 communicated the value of the program fees which average out at $59,333 in developed markets versus $22,625 in emerging markets. Given the different lengths of the programs we also calculated averages on a weekly basis which was then used to calculate implied program fee costs for the programs not disclosing the value. The premium fees charged in developed markets can again be contributed in part to the cost of living (this time for the program operator) and also the quality (in terms of access to experts, know how and capital). We think a program value of $30-50k in developed markets and $15-30k is a fair price for a 3 month program. The question for founders is of course: Is it worth it? To answer that, consider the program as an investment that you want to get 3x return on within a year. Then figure out it the program will bring you $90-150k of value. This could be achieved by; increasing the speed of execution, helping attract talent, signing revenue generating deals, or sourcing capital. Founders are ultimately the ones who have to work hard but accelerators can provide tools and access you wouldn’t normally have. As mentioned above, the program fees were estimated using the weekly averages calculated on an actuals basis from the data available. On an all-in basis (including the program fees) the average pre-money valuation in developed markets was $1,314,679 versus $657,909 in emerging markets giving a premium of 2x. The range of valuations is quite significant here varying by $3.1mn in developed and $1.4mn in emerging programs and this requires close attention of founders considering various program as we’ll discuss below. The same goes for the amount of equity taken which has a broad range (especially in emerging markets), with too many programs taking over 15% in our opinion. In fact, this is one variable that should be consistent between developing and emerging markets (with the valuation varying instead) as investors in both regions should have in mind the founders long term motivation and dilution. Looking at the highs and lows in the valuations above, you cannot immediately imply that those offering lower valuations are unfair. 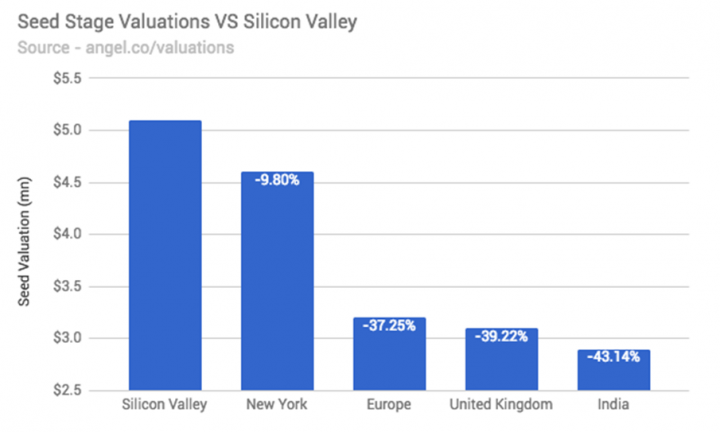 Assuming that accelerators have a consistent IRR target, it’s totally normal there is a range of valuations as the quality and potential success of the startups accepted by each program will vary a lot. The way you can use this data as a founder is when considering two similar programs at one point in time. Then it would make sense for you to understand what you are giving away versus the other options in the market. Startups take note…you aren’t all worth the same! The reality is that all these scenarios are generally in play simultaneously for emerging markets making it hard for the entrepreneurs but also for investors. 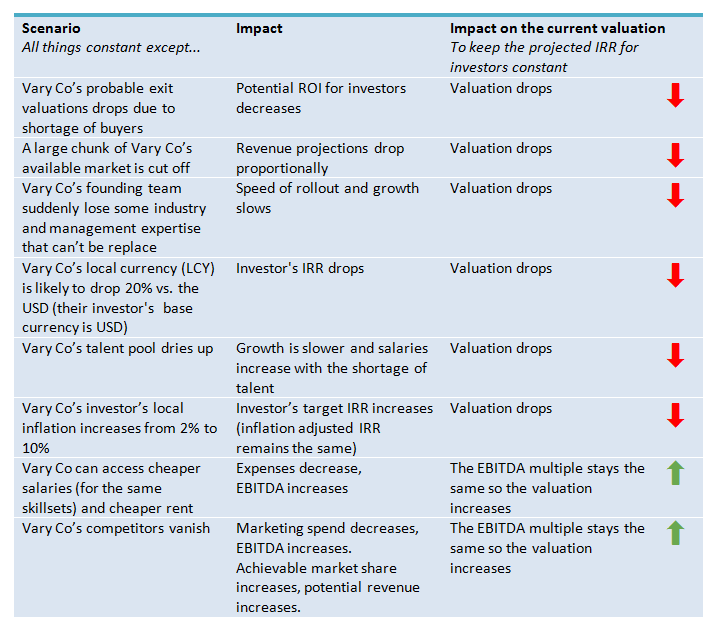 The majority of the common scenarios described above lead to a drop in valuation. The two that could increase the valuation, don’t work exactly as assumed above as lower costs means the price the customers pay also drops and without competitors, you’re probably going to have to spend more educating customers.What these scenarios should clearly demonstrate is that it’s absolutely normal there is a premium on the valuations paid in developed markets vs emerging. To prove the point, take a look at average seed valuations in a few locations listed on AngelList in the chart below. Average European valuations are about 40% lower than in the US and in our opinion, emerging markets should have an additional 30-40% discount. Last year we launched the Seedstars Growth Program as a natural evolution of the Seedstars group and ran the first batch in Q1 2017 with 8 companies (including: Ultracasas, Edupass, QueroQuitar, Acudeen, Jamii, iNukaPap, Democrance, Raye7). From the 8 that took part, we’re following on with second round investments in 4 and busily preparing for batch 2 in Q1 2018. Feel free to add missing data to the database here and let us know if you have any comments on the analysis by email to growth@seedstars.com.